Along with many colleagues, we are very appreciative of the resource that is NRICH and we encourage any mathematics teachers everywhere we meet them to access the website and to make use of the tasks and activities therein. The NRICH team is similarly appreciative of the work we have been undertaking regarding mathematical resilience (Lee and Johnston-Wilder 2014). One of the ways that learners build mathematical resilience is in accepting that engaging in mathematics requires perseverance and struggle, and that otherwise they are not learning. However, resilient learners know that they do not have to struggle alone but should collaborate, or otherwise seek support, so that the struggle is manageable; enough to know that you are being challenged, but not too much. Later in this article we will discuss the growth zone model which helps learners understand their feelings as they move from comfortable tried and tested ways of working in mathematics into learning, reasoning, connecting and developing more efficient ways of enjoying mathematical activity, such as are offered by NRICH activities. Sometimes learners when they are challenged can get ‘out of their depth’ and start to panic, and it may be concerns about this happening that stop learners wanting to jump in and enjoy the feelings of success when challenges are overcome. The symptoms of this panic may not always be easy to read by teachers and other adults working to support learning, as learners develop ways to hide them. Hence one of the characteristics of the mathematically resilient learner is that they have the language both to express any feelings of being out of control and to request the support they need so that they can stay in their growth zone longer. Panic or feelings of anxiety seem to happen very quickly in some learners when they encounter challenge in mathematics. This may be because many learners have had a previous diet of mathematics that they have found easy, or possibly they are used to mathematics learning requiring them to “learn this algorithm” or “remember this way”. When they are offered something that is challenging and requires connecting ideas, thinking and reasoning, as NRICH activities do, they cannot use their standard approaches in mathematics, which leads to the obvious conclusion that “I can’t do it!” This article is about how learners can be helped to move from expecting “doing maths” to mean the teacher smoothing the path, explaining every step and the learner remembering to apply all the steps, towards expecting to engage in mathematics for themselves, and more importantly feel involved, safe and that they enjoy doing mathematics. The term “affective dimension” includes concepts such as beliefs, attitudes and emotions. Engaging in NRICH or other similar activities means that learners will be offered the chance to feel the enjoyment there is to be had from successfully overcoming barriers, the “I did it!” feeling. However many learners experience strong negative emotions when they get stuck and may feel that they have been offered the chance to fail. Unless learners understand that all mathematicians struggle, get stuck and make mistakes, perhaps especially those mathematicians that work with really complex and difficult mathematics, and that many mathematicians like to collaborate with others so that they get ideas and encouragement in the difficult task of learning more mathematics, they may feel justified in concluding that they cannot do mathematics and they will not continue with the struggle. The more work we do within schools the more it seems to us that the reaction “I can’t do maths”, that we hear over and over again, is the result of feelings of anxiety generated by being asked to work in ways that feel unsafe or seem likely to expose the learners to public humiliation, which causes learners to believe that mathematical challenges are best avoided. So the first belief to contradict is the idea that learning mathematics is easy, if you have the right aptitude, and if you do not have that aptitude, as proved by making mistakes and getting stuck, you cannot learn mathematics. Mathematics is often worked on in isolation and often involves rote learning of “number facts” that they are required to manipulate and articulate with speed. These and many other common ways of working in mathematics seem to start to lead some learners, and we think many learners, to begin to become mathematically anxious and to panic. However because they are working on mathematics rather than for example swimming, the panic may not be obvious to mathematics teachers. The learner may feel ashamed and feel they “ought to be able to do it” or may feel that they have no hope of being able to come up with any ideas as they are sure they are not part of the elite few that can do mathematics. If they frequently feel they may be humiliated when they simply “can’t do it”, as confirmed by feeling stuck and making mistakes, they may go on to develop mathematics anxiety and/or avoidance. So the next belief that needs challenging is the idea that mathematics is something that you have to work on by yourself and that you keep quiet if you cannot keep up. Rather collaboration should be the expected way to work and the idea that everyone needs support from the community, peers, adults or texts or internet, as they struggle with the complexities of learning and using mathematics, should be part of classroom culture. The last negative belief that we want to highlight here, is the belief that many learners hold that they are not part of the elite few who can “do” mathematics. This belief is evident in many of the ways that society reacts, for example, it is OK to give a little shudder when faced with some simple multiplicative reasoning and to say “I can’t do maths”, in way that saying “I can’t read” is not and in the way that qualitative data is presented as fact and only questioned by few in society. NRICH tasks are generally accessible to all and extendable as far as the learners want to go. Therefore they are inclusive and suitable for teachers to use to include everyone, no matter what their current experience, in doing mathematics. Using such tasks can help to convince students that they can in fact “do maths” and are part of the community who can learn and do mathematics. However, in order to work in resilient ways and to be part of those who “can do mathematics”, who enjoy using their ideas and what they do know to overcome barriers and feel successful in mathematics, learners first have to be able to get into their growth zone and then, to stay there for a while. In other words, they have to develop ‘mathematical resilience’. There is now much evidence that leads us to believe that learners develop mathematical resilience in a supportive environment, where learning mathematics is, at least sometimes, a collective and collaborative endeavour. The fact that mathematics can be a difficult subject is not hidden but everyone is expected to persevere, to be able to learn, use and control mathematical ideas and experience the good feelings of barriers overcome, and everyone is expected to both need and get appropriate and sufficient support from the whole community of learners. and so on. There are many mantras that teachers use to remind their students that they can and will learn to use and control more and more mathematical ideas if they are well supported and if they persevere. That learning and doing mathematics can feel risky and therefore learners need both to know this and to know how to deal with those feelings of risk and uncertainty. It seems that when these feelings are unexpressed and the learners do not know that such feelings are to be expected, nor how to deal with those feelings, avoidance and anxiety often result. The growth zone model shown below can be useful in giving learners both the language to express their feelings and to alert them to the kinds of feelings that they may experience. This can enable learners to become equipped with approaches that they can use to recognise and to deal with the emotional side of learning mathematics. The growth zone model consists of three concentric zones. 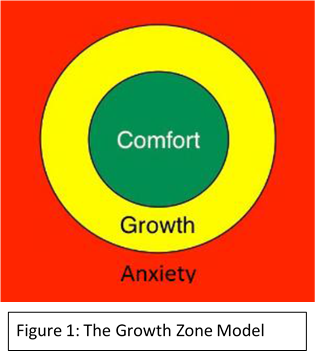 The growth zone can be thought of as sitting between a comfort zone and an anxiety or danger zone, as in Figure 1. In the comfort zone, learners feel comfortable. They will be working on ideas that they understand, consolidating ideas or building fluency. It is important to stress that, despite the usefulness of the work done whilst in this zone, here learners are not learning new things. There is also the potential to become bored, never doing anything new, or in a new way, is tedious. To experience the exciting but somewhat risky feeling of learning something new, learners must move into their growth zone. In the growth zone, students will be learning and as a consequence they will have to struggle to understand. They may feel that they could fail to grasp an idea or overcome one of the many barriers that learning mathematics puts in their way. The fact that they are learning will be demonstrated by the mistakes they will be making and the wrong turns that they will take. Understanding the way learning may feel will demonstrate that they must develop strategies to deal with the feelings that arise and their underlying beliefs and attitudes. In the growth zone learners will need support to manage feelings of risk, potential failure and of making mistakes; how they access that support is best thought out beforehand (a strategy known as “advanced coping” in mental health), as in the growth zone their attention will be on the ideas they are learning. NRICH tasks are ideal for setting up the experiences of challenge and curiosity which enable effective, thought-provoking learning experiences but learners must know that they are not expected to struggle alone, they have a right to be supported. If the appropriate support is not there when needed then the learner may move into the red or anxiety zone. In the red zone learners may feel overwhelmed by the risk and uncertainty and feel very out of control and therefore unsafe. Learners will then experience feelings of panic, and it is likely that the freeze, flight or fight reflex will be triggered, where the amygdala takes over and higher level thinking becomes difficult or impossible, as the brain moves into survival mode. Dan Siegel, neurologist, describes this situation accessibly in his Youtube video. In the video he uses the hand to demonstrate the pre-frontal cortex going offline. A learner is likely to feel mathematically stupid in such a situation. If this happens repeatedly, without the learner being aware of the role of the amygdala, it is likely that the learner will express the view that they ‘can’t do maths’. The learner needs to know in advance that being in the growth zone may trigger productive levels of adrenalin, not too much, but just right. The physical reaction to challenge when supported is constructive influence on potential cognitive development, provided the learner feels any risks are under their control. The growth zone model helps learners remember that when they are learning, problem solving or engaging in a new mathematical way of working they will feel challenged, uncertain and that their self-concept as someone who is able to cope in mathematics is at risk. If they do not experience something of these feelings, they will not be learning as much as they might, and they will not experience the good feelings associated with a challenge overcome. Teachers can use the language of the growth zone model to help learners to become aware of when the challenge is too much and they are moving into the red zone and can help each learner to plan their own ways for moving back into the growth or comfort zones. Currently, learners are often left to cope alone, and it can seem to them that feelings of uncertainty or risk are unusual, rather than a normal result of pushing yourself to learn more. If students become aware that they are panicking, anxiety management approaches such as breathing exercises, especially slightly longer out breaths or breathing with the diaphragm, talking to someone and learning to step away until calm, or taking physical exercise such as a walk, can be suggested, allowing the learner to take back control of their thinking. That persevering is more than persisting. Having the confidence to “have a go” shows that a learner has begun to develop resilience. Resilient learners understand that working at mathematics sometimes means making mistakes and getting stuck, both of which are good indicators of being in the growth zone. However often learners use persistence, which is about keeping on trying, when perseverance may be of more use. Perseverance demands that you keep going but you also recruit support and try alternative approaches, you search for connections and apply what you do know in the hope of finding out more (Williams, 2014). So it is evident from the discussion above that learners make best progress when they are in their growth zone. When they are introduced to the model, some learners have told us that they feel that their growth zone is very narrow and that they slip into their red zone almost immediately. Consequently, when it feels to be just the time to enrich mathematical learning with an interesting problem to solve or activity, it may be safer for some learners if the growth zone model is discussed first. Getting into your growth zone requires first that you know that you have one, which is why a discussion of Dweck’s (2000) mindset theories was suggested as a good place to start. It may be that you have to talk to other adults in the school and to parents and guardians in order to make a significant change in learners’ beliefs that they really can grow their mathematical capability, and that the only ceiling on what they can do and understand is one that they put on themselves, if they are willing to put in the time and effort and recruit appropriate support. There may be structures within school which confirm the fixed mindset idea that each learner has a fixed and measurable potential beyond which they cannot go, such as setting and other classifications of learners, so these may need thinking about first. Think about it the other way, if it were true that people can only learn or attain so much why do we teach at all? The one thing that makes a huge difference to attainment is the teacher (Hattie 2012)), not background or previous experience; teaching makes a difference because everyone can grow with appropriate experience. Getting into your growth zone needs you to feel confident that it is safe to do so. This requires each learner to know that if they get stuck or feel uncertain of what to do next, help will be at hand. That help has to be the right help, we found that even where “Buddies” were well established in a school and that every learner had someone to go to and talk to about any difficulties, the help that was given in mathematics tended to be to simply provide the answer. In mathematics they felt the right answer to be what was needed. Following some in depth exploration and discussions, inclusive of the learners, this school developed “helpful questions to ask when discussing mathematics” so that the learners could help one another experience the good feelings of successfully overcoming barriers and engaging in and learning mathematics. Sometimes learners have not developed any approaches that may help them to get “unstuck” once they are stuck, other than to ask a teacher. Although getting “stuck” may be a sign that you are in your growth zone, not being able to get “unstuck” will mean that you move straight to the red zone, try to disguise your feelings and start to make trouble or just say “I can’t do it!”. One teacher used a “stuck poster” that was specific to each class. Each class suggested ways that they might get “unstuck”, at first it was just “ask the teacher” but once it was pointed out that there was one teacher and 30 students, other ideas were suggested, “look over your notes”, “ask a friend”, “team up with someone else who is at the same point” and so on, appeared on the poster over time as the ideas occurred to the learners. The poster was always displayed and the teacher pointed to it whenever anyone said “I’m stuck”. A learning environment where it is expected that everyone will make mistakes, because you do when you are making progress with your learning, will help people feel safer getting into and staying in their growth zone. One teacher went as far as to celebrate mistakes, asking in the plenary at the end of the lesson for “today’s big mistake” and always asking “so what did you learn from that mistake?” Sometimes learners are very frightened of making mistakes, as they can result in feelings of humiliation, so this teacher turned it on its head and celebrated the mistakes and emphasised what was learned from them. Although the traditional role for the activities and tasks on the NRICH website was to provide challenge for learners who find school mathematics rather easy, we and many others have said elsewhere that it is important for all learners to experience challenge. Challenging tasks help learners see that mathematical learning requires struggle and asks them to develop habits of confidence, persistence and perseverance (Williams, 2014). Tasks such as those on the NRICH website enable learners to build mathematical resilience, and prepare them to understand how to work at mathematics, to figure out what is needed, to try what they know and make connections between mathematical ideas, all of which result in an inclusive, enjoyable and active mathematical learning environment as learners support one another in a common endeavour. As a by-product, such an environment also helps prepare learners to use all those hard-won skills to successfully answer examination questions. If learners do not have the opportunity to experience that mathematics requires struggle, they are less likely to develop resilience, and more likely to give up when mathematics gets harder for example at university even if they found school mathematics relatively easy (Ward–Penny et al 2011). Dweck, C. (2000) Self-Theories: Their Role in Motivation, Personality and Development. New York, NY: Psychology Press. Lee, C. and Johnston-Wilder, S. (2014). Mathematical resilience: what is it and why is it important? In: Chinn, Steve ed. The Routledge International Handbook of Dyscalculia and Mathematical Learning Difficulties. Abingdon: Routledge, pp. 337–345. Ward-Penny, R.; Johnston-Wilder, S. & Lee, C. (2011). Exit interviews: undergraduates who leave mathematics behind. For the Learning of Mathematics, 31(2), 21-26.